The Puzzle–Why Haven’t the Losers Across The Great Divergence Protested? As inequality has steadily increased (worsened) since around the 1970’s the question is, why hasn’t there been more of a popular backlash against it, from the middle and lower classes? It can’t be because they haven’t felt it. The cost of higher education has increased across that period at approximately 2 1/2 times the inflation rate. Inflation alone would justify the $10,000 cost of a college degree in 1986 rising to about $21,000 now, but the real cost today is almost $60,000–and that’s not at Ivy League schools (http://www.forbes.com/sites/steveodland/2012/03/24/college-costs-are-soaring/). The cost of medical care and housing have both significantly outpaced the inflation rate. So, there is no doubt the middle class and the poor have felt it. This state of affairs is addressed in Beatrice Walton’s May 1, 2011, article in the Harvard Political Review (http://harvardpolitics.com/united-states/the-politics-of-inequality/). Quoting an MIT study, she reports that between 1980 and 2005, fully 80% of the US income increase went to the top 1%. The Institute for Policy Studies says that from 1976 to 2007, the income share of that top 1% went from 8.9% of total income, to 23.5%. 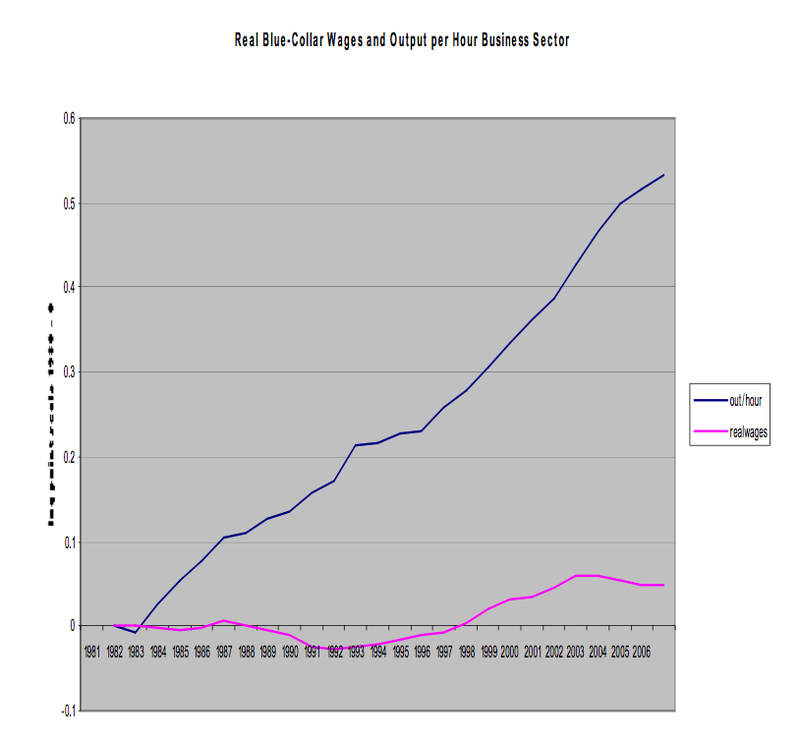 Meanwhile, the real wages of blue collar workers have only increased 4.4% between 1981 and 2006 (http://www.hks.harvard.edu/fs/rlawrence/Lawrence%20for%20Brandeis.pdf). The chart below shows rising productivity of blue collar workers, but stagnant real (inflation adjusted) wages across the long period form the 80s to the present. It can’t be because they haven’t felt it, can it? And, if the workers had not been delivering added productivity (as shown above), the stagnant pay would at least be understandable–but, in fact, worker productivity rose steadily. So, it’s not my imagination–people are suffering, but they’re not protesting very much. In fact, many who have been suffering have somehow bought the rhetoric of the right. I have referred often to the theory of the “tunnel effect” developed by Albert Hirschman around 1973. He said that if two lanes of traffic are passing though a tunnel and one becomes blocked, slows to a standstill, for a time the people in that lane will not be upset, because they see the parallel lane moving swiftly and figure that this will soon be their fate as well–nothing to do but wait. This is the image the Right sells effectively–there is opportunity for everyone, you can be just as successful as the next person, and the last thing you want is to dis-incent motivation to succeed by threatening any form of redistribution. That, so they claim, will only result in no one wanting to take risk or try harder. However, nigh onto 30 years of stagnating real wages is a lot longer than Hirschman had in mind as the level of tolerance. He said that at some point, patience and tolerance would wear out, and there would be protest. Yet, except for Occupy, there has been little protest in the US. And Occupy was unable to get its priorities and agenda together to move the one issue of inequality forward. They had many other elements of dissatisfaction. Similarly, in China, there are hundreds of thousands of protests annually, but even the top ranked areas of concern–pollution, inequality, inflation, and corruption–none of these individually have taken on a national campaign. Of course, in China it is possible that one reason is that the State is prepared to quell any such moves, but that’s not the case here. Why have we been so tolerant, while our lane has been only slowly crawling, and the adjacent lane is moving fast and even steadily accelerating? I believe some reduction in inequality, achieved thoughtfully and gradually, would actually benefit the rich with faster economic growth for all. More important, this is the opinion of many respected economists. What are the ways to do this? A comprehensive health care system is one form of equalization–providing coverage for the middle and lower classes, so that they can stay healthy, can work, and can contribute to the economy. Yes, there is an element of redistribution in any such system–but it’s fair, fits our American ethic of equal rights and privilege for all. Obamacare is one legitimate attempt to do that. Let the Right come forward with its own plan and let’s see if perhaps it can do the job better–we should all be open to that. Another critical element of equalization is education. It has developed that the wealthy send their kids to private schools all the way from kindergarten to Harvard and Yale. But the middle class can no longer afford that burden and are left with the poorly funded public schools and little political voice to influence improvement in them. Hirschman also wrote about this phenomenon, calling it the “exit voice.” That’s when the influential withdraw from public services to get their needs met privately, which they can easily afford, leaving a mess for the rest to try to conquer, with dwindling government and tax revenue for funding, and influence. Rightist rhetoric has done a very effective job in persuading the middle and lower classes to vote for reducing taxes. Some think this is cleverly built into the campaigns of conservatives as a “starve the beast” plan—that is, if lower classes can be sold into lower taxes (which they all can see will increase their take home pay), they won’t translate that to the absolute correlation of less government revenue and therefore less ability to pay for health care, education, housing for the poor, or other forms of welfare. Taxes can play a role. I’m willing to have my income taxes rise a bit and my deductions reduce a bit, if I can see that the investment of these tax dollars is going toward a little more equalization and opportunity for the bottom half of our income pie. What about the inheritance tax? If we are a nation which believes one can pull oneself up by the bootstraps, then why don’t we trust that our children can do that too? Maybe that’s because it’s not really true anymore–you need the 20 years of private education to be able to do that, and it helps if you live in the right (prestigious) neighborhood, belong to the right clubs, and have some money to invest. There are many other ways to achieve gradual redistribution, to gradually reduce the level of inequality. So, it’s clear that the tightening squeeze on the middle and poorer classes is not resulting in significant protest. But, it’s still not clear why those who are losing in the inequality advancement are not protesting more. Credit must be given to the Right for constructing a complex set of messages which obscure some of the equality and opportunity disadvantages–messages about reduced taxes, religion, abortion, military strength, property rights, gun controls, and other things prized by the lesser privileged. The argument that allowing the rich to get richer so that their wealth will trickle down because they will invest it in production and production creates more job, has failed across thirty years. With exceptions, of course, the wealthy are not investing as much as the theory imagines, putting more in liquid investments and homes, boats, planes, etc. So, for now, there can only be hope that some political and economic wisdom can be advanced and we can make some modest adjustments before it’s too late.